Question: Have you ever planted fruit trees in a pot before? If so, was it a success? I haven't done fruit trees in a pot but I read about a local person growing a pineapple in a pot. We're giving it a shot this year. Aw it looks so cute. I haven't planted any fruit trees. Can't wait to see how yours turns out. This is such a fun project. I can't wait for you to begin sharing progress as it grows. Sadly, I can't say that I've really planted much of anything. What a fun hobby - as the boys grow older I think this is something I'd like us to get in to, for sure! lol@ Purple Thumb! It'll be interesting to see the progress of your tree, love this post title, btw. (sounds like a book title). We'll be planting our blueberry tree in a pot this weekend. 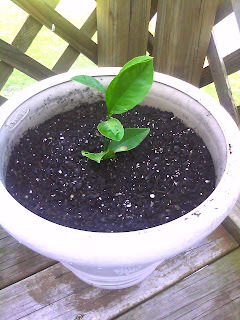 I can't wait to see how your lemon tree grows!